For these 5 reasons, many people wish to have this nuisance animal trapped and removed. However, trappers must take care to avoid being sprayed. SKUNK REMOVAL: Your best bet is to trap the skunks in live cage traps, and relocate them. It’s actually pretty easy to do, and safer and more effective than trying to kill the skunks. You may be worried about the skunk spraying you, but it’s really easy to avoid that. And just so you know, there is absolutely no skunk repellent spray (ironic!) powder, or device that’ll keep them away. But if you trap them and relocate them at least five miles from your property, that should solve the problem. You can either hire a professional to do so for you (laws may prevent you from doing it yourself anyway) and that way you don’t have to worry about getting sprayed, and if you want to try to do it yourself, I have written a full guide which you can read on how to trap skunks here. If the skunk has fallen down a window well or basement, you can have a pro snare if for you, or you can put a wooden board down the window well, and the skunk should be able to climb out. Skunk species vary in size from about 15.6 to 37 in (40 to 94 cm) and in weight from about 1.1 lb to 18 lb. Skunks have moderately elongated bodies with relatively short, well-muscled legs and long front claws for rooting and digging. Although the most common fur color is black and white, some skunks are brown or cinnamon and a few are cream-colored. All skunks are striped, even from birth. Skunks may have a single thick stripe across back and tail, two thinner stripes, or a series of white spots and broken stripes (in the case of the spotted skunk). Some also have stripes on their legs, as well some are almost solid black or solid white. There are many different kinds of skunks. Skunks vary in size (cat-sized) and appear in a variety of striped, spotted, and swirled patterns, but most are a vivid black-and-white that makes them easily identifiable and may alert predators to their pungent potential. Average Size: 20 – 30″ long (including the tail); 6 – 10 lbs. The striped skunk is about the size of an adult house cat and its fur is mostly black with white on top of the head and neck. In most animals the white extends down the back, usually separating into two white stripes. Spotted skunks are black with white spots or short white streaks. Skunks are smaller than the striped skunk, about half the size of a house cat. Skunks are nocturnal, hunting at night for insects, grubs, small rodents, snakes, frogs, mushrooms, berries and fruit, pet food, bird food, and garbage. Skunks have a high preference for eggs and, as a result, ground-nesting birds suffer losses. Breeding usually occurs during February and March for the striped skunk; gestation time is about 9 weeks and litters range from four to six kits. After a few months the kits can be seen following their mother as she makes her nightly rounds in search of food. Skunks do not hibernate, but in regions of colder weather females may congregate in communal dens during the winter. Skunks often den in burrows, but because Skunks prefer to do as little rooting and digging as possible, Skunks will use abandoned burrows dug by ground squirrels, fox, or coyotes, enlarging them only if necessary. If dens are scarce, Skunks will readily use brush piles, hollow logs, and culverts. In urban settings, Skunks den under decks, porches, or beneath buildings. What Dangers Do Skunks Face? Skunks only have one main predator, the Great Horned Owl. The owl swoops down from above the skunk so quickly that the skunk cannot detect its presence. Also, the Great Horned Owl has a poor sense of smell, which serves as an advantage because if the skunk were to spray, the owl would not be affected by the odor and would eat the skunk anyways. In contrast, animals such as foxes, wolves, bobcats, and other animals that may attempt to prey on the skunks are likely to retreat after suffering from the horrible stench. Humans are responsible for about half of skunks’ deaths each year. Spraying dogs, rooting and digging holes, and creating their homes under houses and porches cause skunks to be seen as a nuisance. When skunks take part in these activities, wildlife control will resort to eliminating the skunks that are causing problems. Also, skunks have trouble seeing cars coming, due to their poor eyesight, which makes them easy targets for automobiles. Disease poses an additional danger for skunks, particularly rabies. Skunks are among the highest carriers of rabies. Striped Skunks only have a few predators, including: owls, hawks, and foxes. Skunks eat many kinds of animal and vegetable foods, including: beetles, grasshoppers, crickets, caterpillars, ants, bees, wasps, earthworms, millipedes, centipedes, crayfish, snails, slugs, salamanders, frogs, turtle eggs, eggs of ground-nesting birds, mice, shrews, squirrels, young rabbits, fish, small snakes, cherries, blackberries, blueberries, grasses, nuts, and carrion. Striped Skunks will often dig for their food, especially grubs (beetle larvae) and mice. There is cause for concern when skunks take up residence in an urban or suburban area because in California Skunks are primary carriers of rabies, a viral disease transmitted by the bite of an infected animal. Skunks are also carriers of other diseases including leptospirosis, listeriosis, canine distemper, canine hepatitis, Q-fever, tularemia, and trypanosome. Skunks are attracted to residential areas by the ready availability of food, water, and shelter. Skunks become a nuisance when Skunks live under porches, decks, garden tool sheds, or homes. Skunks like to feed on ripening berries and fallen fruit and cause many other garden problems by rooting and digging while in search of grubs and other insects. Skunks often search for food in lawns by rooting and digging small pits or cone-shaped depressions that range from to 3 to 5 inches across. Like raccoons, Skunks may also damage lawns by rolling back sections of sod in search of insects. Spotted skunk or civet cat. Striped skunk. Two skunk species found in Missouri State. Skunks will eat what Skunks can find or catch. Skunks have large feet, well-developed claws, and rooting and digging is their primary method used to obtain food. Some of their favorite foods include, mice, moles, voles, rats, birds and their eggs, and carcasses—also grasshoppers, wasps, bees, crickets, beetles, and beetle larvae. 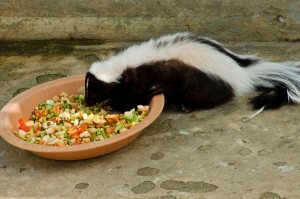 Skunks also eat fruits, nuts, garden crops, and scavenge on garbage, birdseed, and pet food. Skunks will roll caterpillars on the ground to remove the hairs before eating them. Skunks will also roll beetles that emit a defensive scent, causing the beetle to deplete its scent before Skunks eat it. Skunks eat plant and animal foods in about equal amounts during fall and winter. Skunks eat considerably more animal matter during spring and summer when insects, their preferred food, are more available. Grasshoppers, beetles, and crickets are the adult insects most often taken. Field and house mice are regular and important items in the skunk diet, particularly in winter. Rats, cottontail rabbits, and other small mammals are taken when other food is scarce. Skunks become a nuisance when their burrowing and feeding habits conflict with humans. Skunks may burrow under porches or buildings by entering foundation openings. Garbage or refuse left outdoors may be disturbed by skunks. Skunks may damage beehives by attempting to feed on bees. Occasionally, Skunks feed on corn, eating only the lower ears. If the cornstalk is knocked over, however, raccoons are more likely the cause of damage. Damage to the upper ears of corn is indicative of birds, deer, or squirrels. Skunks dig holes in lawns, golf courses, and gardens to search for insect grubs found in the soil. Rooting and digging normally appears as small, 3- to 4-inch (7- to 10-cm) cone-shaped holes or patches of upturned earth. Several other animals, including domestic dogs, also dig in lawns. Skunks occasionally kill poultry and eat eggs. Skunks normally do not climb fences to get to poultry. By contrast, rats, weasels, mink, and raccoons regularly climb fences. If skunks gain access, Skunks will normally feed on the eggs and occasionally kill one or two fowl. Eggs usually are opened on one end with the edges crushed inward. Weasels, mink, dogs and raccoons usually kill several chickens or ducks at a time. Tracks of the striped skunk Dogs will often severely mutilate poultry. Tracks may be used to identify the animal causing damage. Both the hind and forefeet of skunks have five toes. In some cases, the fifth toe may not be obvious. Claw marks are usually visible, but the heels of the forefeet normally are not. The hind feet tracks are approximately 2 1/2 inches long (6.3 cm) (Fig. 3). Skunk droppings can often be identified by the undigested insect parts Skunks contain. Droppings are 1/4 to 1/2 inch (6 to 13 mm) in diameter and 1 to 2 inches (2.5 to 5 cm) long. 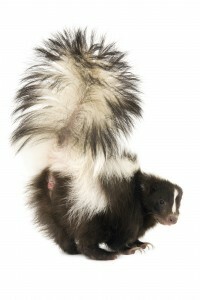 Odor is not always a reliable indicator of the presence or absence of skunks. Sometimes dogs, cats, or other animals that have been sprayed by skunks move under houses and make owners mistakenly think skunks are present. Rabies may be carried by skunks on occasion. Skunks are the primary carriers of rabies in the Midwest. When rabies outbreaks occur, the ease with which rabid animals can be contacted increases. Therefore, rabid skunks are prime vectors for the spread of the virus. Avoid overly aggressive skunks that approach without hesitation. Any skunk showing abnormal behavior, such as daytime activity, may be rabid and should be treated with caution. Report suspicious behavior to local animal control authorities. Skunks are infamous producers of an odor so powerful that it quickly and easily communicates a clear message: “Don’t mess with me.” Although known mostly for its robust smell, the chemical can also cause intense discomfort if it gets into a person’s or animal’s eyes. Fortunately, the skunk’s characteristic black and white coloring is so recognizable that most potential victims have fair warning. Though blending into the landscape is a more common form of protection in the wild, being so distinguishable is generally beneficial to skunks because it can dissuade many wild animals, and the occasional dog with more than half a brain, from attacking. Occasional skunk sightings in a neighborhood doesn’t necessarily mean there is a problem. Measures can be taken to discourage skunks from sticking around. These include removing garbage and pet food left out at night and eliminating convenient denning sites such as wood and rock piles, elevated sheds, openings under concrete slabs and porches and access to crawl spaces under houses. Skunks are usually announced more from smell than sight. Musk odor might linger for days where a skunk has sprayed. Persistent, faint musk smells associated with a 4-6 inch diameter hole under a building or woodpile indicates that a skunk may have taken up residence. If you discover a den that you suspect might belong to a skunk, first check to see if the occupancy is current. This may be done by loosely filling the hole (or holes) with soil, leaves or material such as straw. If a skunk is present, it will easily push its way out that night and reopen the hole. If the plug remains undisturbed for two or three nights (and it is not winter), it is safe to assume that the hole is unoccupied and can be permanently closed. If a skunk, or any other animal, is present, either harassment or eviction using a one-way door system is recommended. Harassment – When it is safe to displace skunks, mild harassment can be very effective. First try repacking the hole the skunk is using with leaves or other material to see if it will get the message and move elsewhere. If this fails, place eviction fluid soaked rags near or inside the burrow to one side so that the skunk has to pass them to get in and out. Make sure the skunk is not close by before taking either of these measures. Eviction – A skunk may be evicted from an active den by installing a one-way door over the entrance to allow it to leave but prevent reentry. These doors are available commercially or Wildlife Command Center can install them for you.